A leading Publisher of Genre Fiction, Pro Se Productions welcomed Author Rick Nichol's popular series of thrillers featuring P.I. John Logan to its lineup with COLD DISH. The fifth in the Logan series is now available as a top quality audio book produced by Radio Archives! With his home in ruins, his lover in a coma, and his best friend missing, John Logan finds himself injured, alone, and fighting to protect an innocent witness while he works to uncover the truth behind the bombing that has shaken his world. His search will uncover an old familiar killer, a man whose money and power seems endless. It will take all of Logan’s skill and determination to survive. For how does someone who has nothing fight a man who has everything? Pro Se Productions presents the fifth volume in the popular John Logan thriller series by Rick Nichols. Featuring a terrific cover by Kent Holloway and a thrilling performance by Daniel Coker, COLD DISH is available now at Amazon at https://www.amazon.com/Cold-Dish-John-Logan-Thriller/dp/B01HU5F1PG/ref=tmm_aud_swatch_0?_encoding=UTF8&qid=1467738634&sr=8-1-fkmr0. This exciting John Logan audio book is also available on Audible and Itunes. 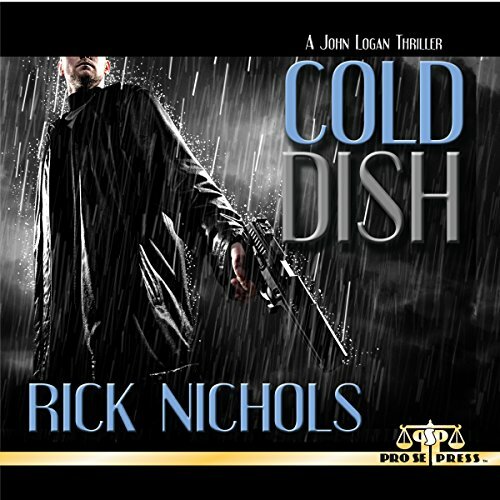 COLD DISH is available in print and digital formats at Amazon and www.prose-press.com. THE GUNSMITH #404: THREE RINGS OF JUSTICE NOW AVAILABLE IN PRINT!